from the lithograph by Baugniet. This portrait is a reproduction of a proof impression, showing retouching by Cruikshank himself. 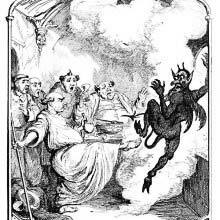 George Cruikshank’s special merit (I leave aside all his other merits, such as subtlety of expression, intelligence of the fantastique, etc.) is an inexhaustible abundance in the grotesque. This verve is unbelievable and would be said to be impossible if we didn’t have enough evidence in the shape of a tremendous body of work, an innumerable collection of illustrations and endless series of comic albums; in short, such an amount of characters, situations, physiognomies, and grotesque scenes that the memory of the observer is at a loss. 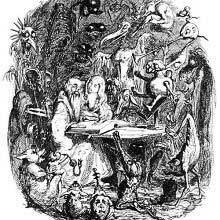 The grotesque flows incessantly and inevitably from Cruikshank’s pen, like rich rhymes from the quill of natural poets. The grotesque is his habit. If we could analyze with certainty such a fleeting and intangible thing as emotion in art, this je ne sais quoi which always distinguishes one artist from the next, however closely they might seem to be related, I would say that Cruikshank’s grotesque is mainly made of extravagant violence of gesture and movement, and explosive expression. All his little characters play their part with fury and boisterousness, like pantomime comedians. The only weakness we could hold against him is that he is often more a man of wit and a cartoonist rather than an artist. It looks as though, in the pleasure he takes indulging in his prodigious wit, the creator forgets to endow his characters with enough vitality. He draws a little too much like writers who enjoy scribbling down sketches. These astonishing little creatures were not always born viable. All this tiny crowd bustles about, tumbles and mingles with indescribable vivacity, without fussing too much about limbs not being exactly where they should be. Too often it is made of mere human hypotheses who thrash about the best they can. 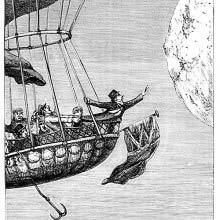 All the same, as he is Cruikshank is an artist of great comical power who will remain in every collection. ^ Le fantastique is a genre which overlaps with horror and fantasy. It includes authors such as E. T. A. Hoffmann, E. A. Poe, and Mary Shelley. This article is based on a passage from Curiosités esthétiques: Salon 1845-1859 by Charles Baudelaire, published in Paris by Michel Lévy Frères, 1868. Image source: Kitton, Frederic George. Dickens and his illustrators . London: George Redway, 1899.